If you really want to know if your events are successful or not, then stop looking at the data. I’m serious! Checking the numbers and event KPIs won’t give you a clear picture about your attendees’ perceptions. What’s more important: how many times your event app was downloaded or how your guests felt about their experience? By getting the right feedback (whether positive or negative) from your attendees, you’ll know exactly what worked at your event and what you should improve. It’s the same thing as app reviews or customer service requests. When startups communicate with their clients, they’re able to make better decisions. For example, they can fix some bugs, introduce new features, or upgrade the product. If you want to improve your planning skills and make your events even more beneficial, you must follow two steps. The first one is to gather the attendees’ feedback. Obviously, you should avoid going about this in a boring way. How many event guests do you think have opened your email, looked at the survey you sent, made the mental note, “I’ll do it tomorrow,” and then forgot all about it? Too many to count. To solve this problem, you could use live polling during the event, or you could incentivize your attendees (discount on upcoming event, gift cards, etc.) to be the first ones to answer the survey. The second step is to take this feedback and transform it into valuable insights. There’s no point in making your attendees complete a survey if you don’t actually do anything with this information. You must follow up with a decoding procedure. There’s one thing event professionals don’t pay too much attention to when they design a survey: the survey questions. Usually, they just create a quick sheet with one question: “How did you like the following aspects?” Then, they will add a few concepts, such as the program, catering, venue, speakers, etc., with a scoring scale from 0 to 5 or 0 to 10, and possibly a comment box. That’s one way to gather feedback, but that information won’t help you gain truly constructive insights to help you improve your events. Most attendees will just jot down a few numbers and leave the comment box blank, or maybe write a few words. Let’s imagine a quick situation: You sent attendees a survey, and half the attendees scored the venue at a 2, and the other half scored it a 5. What conclusions can you draw from this information? Obviously not much. Use different types of questions (both open- and closed-ended), introduce more concepts, and get people to explain their opinions. Apart from that, take the time to formulate interesting questions that will make people enjoy the experience and actually provide authentic answers. If you want to get real insights from your attendees, don’t wait too long to ask. If you email your guests a week after the event, chances are their memories won’t be fresh enough for them to provide you with genuine answers. Don’t let too much time to pass between the event and when you ask for feedback. Better yet, organize live polling during the last session of the event so you can get a general, real-time vibe about the experience. For even more detailed answers, you could use an event mobile app to send ad-hoc surveys a few hours after the event. 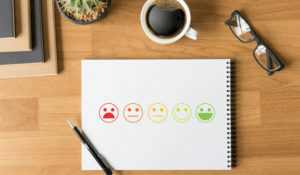 From cross-sectional and longitudinal surveys to interviews and questionnaires, there’s no shortage of methods you could use to get worthwhile attendee feedback. You have a wealth of tools for experimentation. Try as many types of surveying models as you can and find out which one gets you the best results. Maybe you’ll discover that just by talking face-to-face with four or five attendees is more than enough to understand what you must change or improve. Find the tool that works best for you. After you gather up everyone’s feedback, it’s time to schedule a meeting with your event team and talk about what went right and wrong in the guests’ eyes. First, ask the team members how they felt about the event, what they noticed, what they thought went well, and what exactly would they improve. Then, share the guests’ feedback and discuss the main highlights and narrative patterns you noticed. Make a list of the best practices you used for the event (according to your attendees’ answers regarding the things they liked the most). Subsequently, ask your team about the insights they gained from the attendees’ feedback. The last step is to decide what must be changed or improved. No matter what indicators you use to evaluate the success of your event, at the end of the day, there’s nothing more powerful than your attendees’ feedback. Whether it’s during or immediately after the event, use different tools and methods (surveys, live polling, interviews, etc.) to understand the overall perception your guests have about the event. Apart from that, don’t keep these event-related insights you’ve gained after decoding your attendees’ answers to yourself; analyze the data with your team members, and use it to improve your next event.